The event will be held on November 22 in the Bunker Auditorium at the School of Mines Green Center. Hope to see you there! Looking to be a tool?! Better yet… a tool dressed as an elf? We are looking forward to seeing all of you who love to run (or volunteer for support staff) at our 2nd Annual Be A Tool 5K. 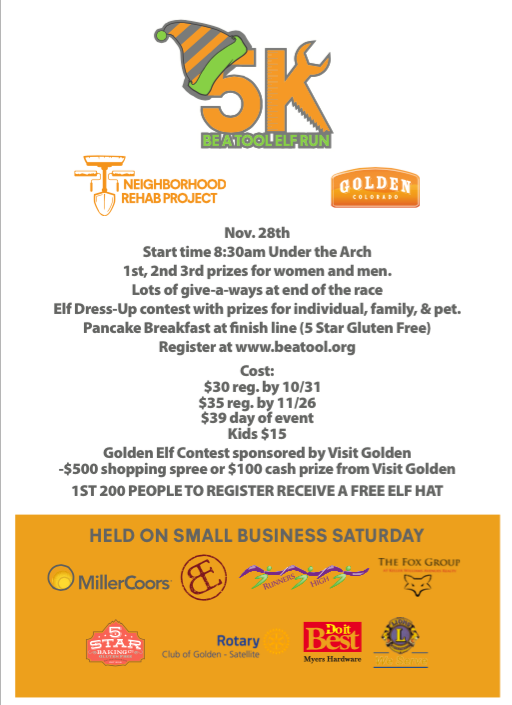 All proceeds from the race go towards materials for our annual Day of Service which this past September mobilized over 400 volunteers and impacted over 40 Golden neighbor’s homes with needed repair and care. Mark your calendars for Saturday November 28th! Registration is now open at www.beatool.org! Email info@beatool.org if you are interested in volunteering.